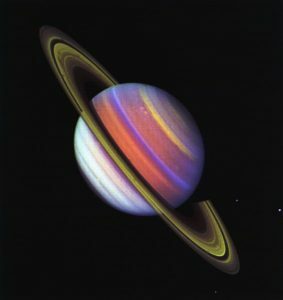 Does it matter how far away the planets are from the earth? If Jupiter is, say, on the other side of the solar system from us, does that weaken Jupiter’s power? Or is its effect stronger when it’s right next door? Questions like this, that have a yes or no answer, are called propositions and the answer has to be yes or no. Did it rain today? Well, it did. Or it didn’t. Yes or no. It doesn’t rain and not rain. So that question should have a YES or NO answer. So what if the answer is NO, in astrology the distance of a planet has no effect? That presents some real problems. If the effect of a planet is the same whether it’s close or far away then the effect would be the same no matter where the planet was in the universe. So our old friend Jupiter could be 10 miles from earth, or 10 light years, or 10 million light years and we would feel the exact same influences. It’s hard to imagine Jupiter 10 billion light years away having any effect on our lives. But we would sure notice if Jupiter were 10 miles away! The other problem is that there are other Jupiters out there. Lots of them. Billions of them. Billions and Billions all over the universe. So if it doesn’t matter how far away these planets are, then they would all be affecting our lives equally. Kinda like having billions of mother-in-laws all telling us what to do at same time with equally loud voices. Finally, in everyday life and science (oops there’s the “s” word), distance does matter! A car horn that honks down the street is not as loud as a car horn that honks when your head is under the hood of the car! Headlights get brighter as they approach. It’s warmer near the fire. And in the world of planets, the Moon has a much greater effect on the tides of the ocean than the Sun, even though the moon is much smaller. This is because the moon is right next door and therefore its gravity is very strong. Move the Moon to where, say, Pluto is and it would have no effect on the tides. This concept of the strength of an effect getting smaller as it moves farther away even has a description in mathematics called the “inverse square law”. It says if a light is twice as far away, it’s one-fourth as bright. This law works for light, sound, heat and gravity so it should apply to whatever “force” the planets exert. So then, if the answer is YES… what does that mean? It seems like common sense that if a planet is closer to the earth, then its influence on our lives will be greater. Makes sense. And it worked well for astrologers back in the day of astrology’s grandaddy, Ptolemy, with his geocentric, the earth is the center of the universe, world view. But then along came Copernicus and screwed up everything. He put the Sun in the middle and things have been sort of topsy turvy ever since. Because when you look up in the night sky, what you see is definitely not what you get. And the whole concept of Astrological Aspects gets tossed out of the window! Want to see why? Stick with me and I’ll give you a quick example. Here is a diagram (not to scale!) of a conjunction of Venus and the Sun. From Earth they appear to be in the same part of the sky. This conjunction has certain astrological meanings derived through centuries of observation. Here is a diagram of another possible conjunction of venus and the sun. From earth they appear to be in the same part of the sky. This conjunction has the same astrological meanings derived through centuries of observation — nothing different. But wait! Venus is way over in the next county! Shouldn’t the vast change in distance (130 million miles!) cause a vast change in the effects of this type of conjunction? Of course! But astrologers make no adjustment for the distance of venus. So two completely different positions of venus are treated as the same occurrence and interpreted in the same way. This second type of conjunction should have a much weakened effect. Distance must matter and astrologers must begin to take into account the actual position of the planets when they interpret their apparent placement in the sky. This will produce an even richer tapestry of interpretation that will flourish in this third millennium. I don’t know much about astrology but I -am- a healer, I work with nonphysical energies and make aches and pains and moods go away in seconds with it. So my observation is that you think that 100% of the universe is visible and tangible, when that part of the universe is possibly just the tip of the iceberg when it comes to the totality of existence. In the unseen, nonphysical areas of existence distance seriously does not matter. I suppose because those areas are outside of spacetime. The funny part of all this is that I was doing a bit of research into astrology because it kinda relates to what I’m working with with the body right now and the first question that popped into my head was “does distance from a planet make a difference in astrology”, and wouldn’t you know it, I couldn’t find a single other webpage that talks about that. You’d think that would be on the top of everyone’s list. But you actually answered the question for me with your pictures. Thanks! From my experience with energy work the distance not being a factor really does make sense, so the answer doesn’t surprise me. And I’m a scientist by the way. So don’t make fun of people wholesale too quickly. It shows you really don’t know about the people you’re jabbing at. I agree there are many things we don’t know or yet perceive so I keep and open mind. The purpose of my discussions is to stimulate thought and discussion about various topics. And I don’t intend to make fun of anyone’s thoughts or opinions. Only to suggest additional ideas or interpretations that have not been considered. The purpose is to increase my knowledge and awareness as well, everyone feel free to comment. I seek enlightenment from others. I have tried to discover some scientific exploration as to the planets defined influences and where these interpretations came from. To my knowledge there is no concise information. Astrology goes back to Claudius Ptolemy of Alexandria in the second century AD and he systemizes ideas from Egypt and the Chaldeans before him. He is considered to have had an influence on astrology for 1000+ years, so studying his “TetraBiblios (four books)” may be a good start.